The Aviation Minister, Baroness Sugg CBE, has provided a written update to the All-Party Parliamentary Group (APPG) on General Aviation on the progress Government is making towards fulfilling its objective of making the United Kingdom the best country in the world for General Aviation. 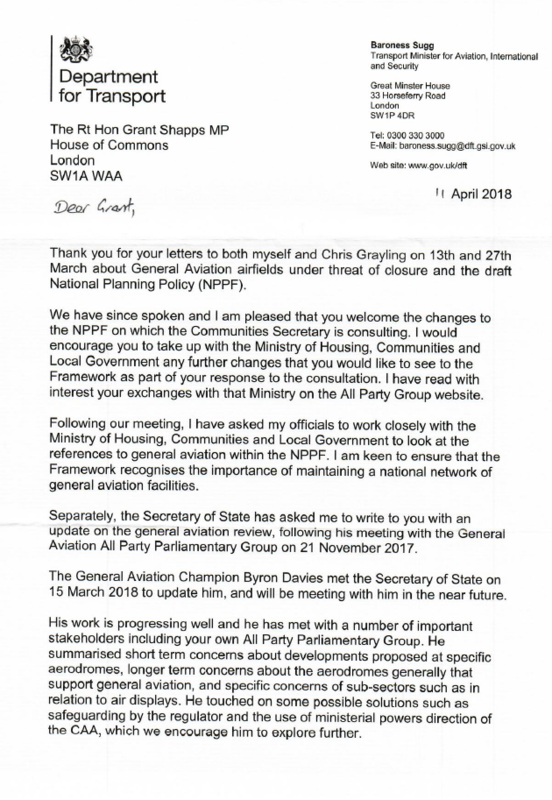 In a letter to the 153-strong cross-party group, the Minister said she had “asked [her] officials to work closely with the Ministry of Housing, Communities and Local Government to look at the references to general aviation within the National Planning Policy Framework”. The Baroness also updated the group on the activities of the Government’s first ever General Aviation Champion, Byron Davies. The Minister said Mr Davies had identified some “possible solutions” to issues around developments at specific aerodromes and air displays. These solutions include safeguarding of aerodromes by the Civil Aviation Authority (CAA), and the use of ministerial powers to direct the CAA on this matter. Baroness Sugg pledged to update the all-party group once Mr Davies has published his interim report on the status of the UK’s General Aviation sector in the near future. Commenting on the letter, Chair of the parliamentary group Grant Shapps MP said: “I welcome this important update from the Aviation Minister on the progress her department has made towards securing the UK’s vital STEM job-creating General Aviation sector. This letter is a useful start, but there are now 153 parliamentarians in the All-Party Parliamentary Group and they will soon want to see the government move beyond words and towards substantive action. “The Minister’s support for the amendments to the National Planning Policy Framework, which specifically recognises the importance of General Aviation to the economy for the first time, are reassuring for the £3bn sector-at-large. However, we know more tweaks to the Planning Framework are urgently required and we have yet to receive a clear undertaking from the Department for Transport that they are fighting for these same Framework changes in Whitehall. “The all-party group will do everything it can to work with the Department for Transport and the Ministry of Housing, Communities and Local Government to secure the UK’s world-leading £60.6bn aviation sector, and the 38,000 high-tech jobs that General Aviation directly provides”. The National Planning Policy Framework changes requested are available at www.generalaviationappg.uk/nppf and the APPG would like to see ministers back these specific changes to better promote general aviation jobs and growth. The full letter from the Aviation Minister can be read below.